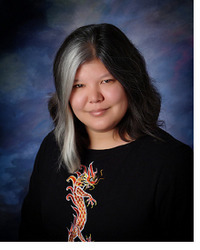 Please welcome Julie Kagawa on our Blog today, she’s the author of “The Iron Fey” saga. 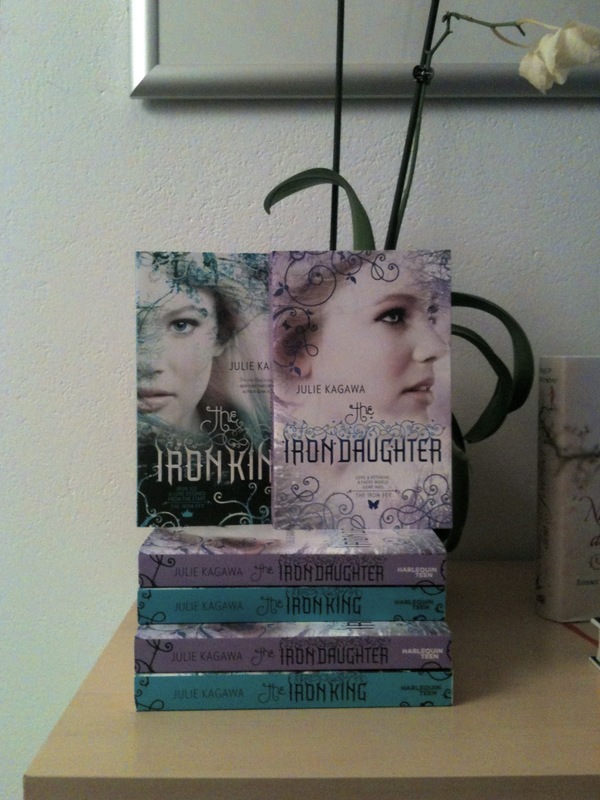 It’s a Trilogy and Book I “The Iron King” and Book II “The Iron Daughter” are already out. 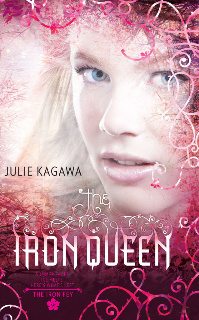 The highly anticipated third Book : “The Iron Queen” will be published in February 2011.
on the Bookworms! I gave both books 5 bewitched bookies! “Winters Passage”, and of course we also reviewed it! Ok enough for the intro, please let’s welcome Julie Kagawa now and let’s move on with the interview. But please stay until the end, because we have an awesome giveaway at the end for all of you!! Bookworms: How long did it take from the idea of the Iron Fey saga to the first draft of Iron King? And how long did it then take to get it published? Julie: The Iron King took me a little under two months to finish, since I wrote it for NaNo Wrimo, where you have to write 50,000 words in 30 days. At that time, Harlequin Teen was just beginning to cast their net for submissions, and bought in within a few weeks. Bookworms: Why did you choose Faeries? Is it something you were always interested in? Julie: I wanted to write a Faery book that was a little bit different, but yes, I’ve always loved the Fey. Bookworms: Now that you finished the last book in the Iron King series, The Iron Queen, what are your future plans? Can you give us a little hint about your new books? (*pretty please* ) And will it also be a Young Adult story? Bookworms: What was the last book you read? Julie: NEVERMORE by Kelly Creagh. It was excellent! Bookworms : Was it always a dream of yours to become a writer? Julie: Well, I first wanted to be a veterinarian. But then I discovered the uber amounts of science and math required to become one, and since numbers hate me, I figured I’d give this author thing a try. I had this ridiculous notion that I could write and publish a book before I went to collage. Yes, you may stop laughing now. the boys will lose the girl he’s in love with? Bookworms: How much research did you have do to match what is ‘known’ about fairies, especially the nods towards A Midsummer Night’s Dream? Julie: Most of my research I did online, but the nice thing about faeries is: there are so many stories and legends about them. Puck, for example, is always a prankster, but in some stories he’s shown as evil and malicious while in others he’s friendly and helpful. So there’s no set personality to ‘match’ him to. The same goes for most other faeries. ( and no, the goat doesn’t count anymore hehe) ? 2. I once had a pet tarantula. 3. I swam with a sea turtle in the ocean. 4. I trained a cat to sit, lie down, and roll over. 5. I’m a video game nut. Bookworms: Anything else you would love to add? 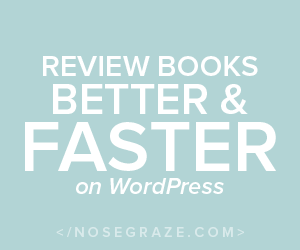 Bookworms: Well, we than you for taking your time to answer our questions! Wo loved the Iron Fey saga and Julie as much as we do? Team Ash or Team Puck? If you like them, please feel free to grab them! Who hasn’t read the books yet but totally want to? And exactly for you people we have this awesome giveaway! super generous to give me so many books for this giveaway! …and of course this contest is open internationally! on Friday 5th of November! Grab the Button if you want to link back! Tags: contests, Danny, Julie Kagawa, Love me some Faeries, The Iron Fey Saga, Uhyesplease, who doesn't love faery stories? « Let’s Get This Hop Started!!!! OMG OMG OMG OMG OMG! *ahem* Sorry. These books just have that effect on me. I am so torn between Ash and Puck it's not even funny. Just after finishing The Iron Daughter, I was like, "Ash all the way!" But the more I thought about it later, the more I realized there is likely much more going on with Puck than what we've been shown. Can. Not. Wait. For book three. I love the covers!! They're beautiful! It's funny, because I already stalk Kagawa, I kind of already knew a lot of her answers. I've read many interviews with her, yet she always fascinates me. I can't wait for The Iron Queen and the new vampire series. Amazing giveaway!I have heard so much about this series and i'm dying to read it! I love faeries! And this series looks great I've heard great things about it! Great interview and totally AWESOME giveaway. I have read Iron King and Daughter but I don't actually own the books. Thank you for the chance to win the set! 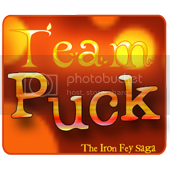 I tend to root for the underdog, so I am a little more Team Puck than Ash… but really I love them both!! My recent post Two-Step on over for the Book Blogger Hop! Great interview ladies!! Julie is the sweetest thing ever. I entered because the books that I have are ARC's and I would love to have the original books in my shelves. Waah, that' so cool <3 I'm excited for reading these books! Thanks for the giveaway! Thank you for the interview and great giveaway! 😀 The Iron King is awesome! Sounds like fun ! 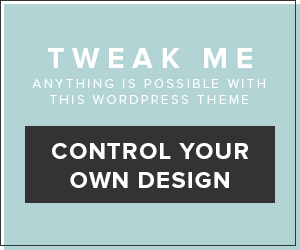 I like the look of your blog. Stop by my book blog some time. My recent post Iron Fey Package Giveaway at Bewitched Bookworms!!! I would love to own these as I got them from the library. Team Ash, though Puck is a pretty wonderful BFF – it will be sad to see his heartbreak. Wow! Great giveaway. I'd love to read these. What an amazing giveaway! count me in:) hehe Great interview! Yay I am loveing this giveaway! I really want to read these books, and I love Julie! ohhhh, i've been eyeing up this series forever! it's like this contest was made for me!! My recent post Clockwork Prince- Teaser for Thursday! I really like what she said about research, and how Puck is portrayed (and yes, I'm team Puck — can't help myself!) These are great books — thanks for posting the interview!! Excellent Interview! I loved the Iron King. Thanks for the giveaway!!! Great interview and awesome giveaway. Thanks!!!! Great interview! You girls are really awesome for this giveaway! Love this interview, I've read and loved The Iron King, but haven't read The Iron Daughter. Thanks for sharing the interview and the giveaway! 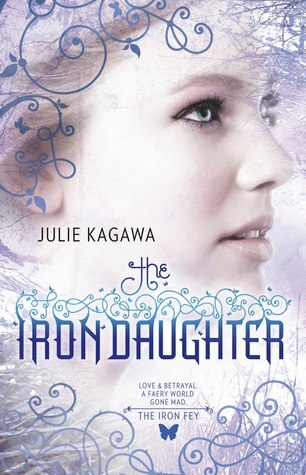 I haven't read the Iron Daughter yet but I'm waiting for it as it is still pending in the library. darn. thanks for the neat giveaway! Thanks for the great giveaway, I've been wanting to start this series! I have really been wanting to read these books. I've heard such fabulous reviews and the author seems like she's a real kick. Thanks for the interview and the chance to win! THANK YOU for this GIVEAWAY!!! Those are definatly very pretty books!!! I loved this giveaway! I want this books! Ooh..ooh! ^jumps up and down with hand raised^ That's me! Have read this series yet, but have WONDERFUL things. Count me in please! As for the interview…marvelous, simply marvelous. Really a vet? Interesting turn to authorville there. Can't wait to learn more about the new YA book in the works. Small world…NEVERMORE is one of my next reads too. ^_^ Happy reading! I am IN LOVE with these books 😀 Thanks for the awesome giveaway!!!! The Iron Frey is my favorite series! I am so excited about the Iron Queen. Bring on February. I love to read … and would love this set! Great interview. I have read so many great things about htis series.I think its about time I jump on the bandwagon and read them. My recent post Iron Fey Giveaway!! whoa! how exciting! good interview. I've been hearing a lot of good things about this series. I'm really looking forward to read the books. Thank you for the giveaway! i´m excited about the giveaway!! I have yet to pick up the series, but I've had my eye on them since the last one was announced. Thanks for the interview & giveaway! Great interview. Julie is such an awesome author! I am so excited! The covers are so beautiful! Thanks for the comp. She wrestled a goat? That's funny. 🙂 I haven't read any of these books yet. They sound great, though. Thanks for the interview and giveaway. I have only read a couple of fairy books, but I have loved them all. I would love the opportunity to read these! I was so happy to see you were having a giveaway. Great interview too – loved the random facts! I'm getting excited just thinking about the giveaway! Cool interview! Julie: He looked at me funny. 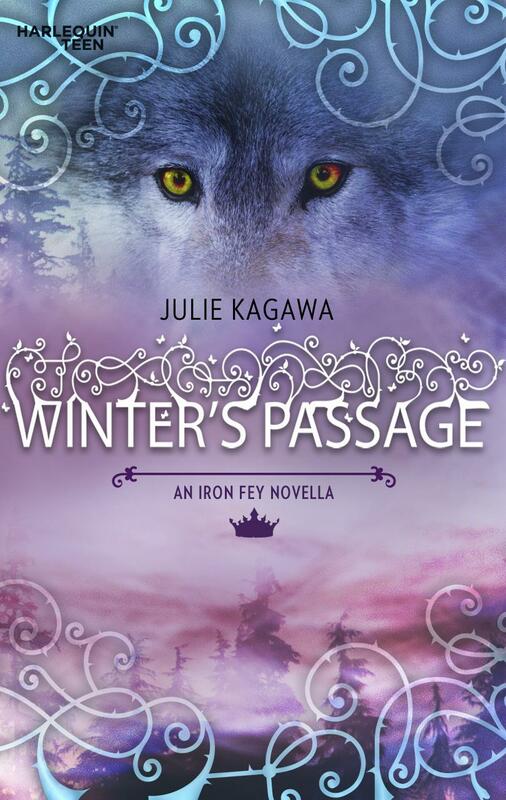 I can't wait to see the world that Julie Kagawa is going to create in her new series!!! Thanks for making this giveaway international!! so excited! I was planning to read the books! I'm just in love with the covers! I've heard a lot of good things about the series and can't wait to read it 🙂 thanks for a chance to win it! Wow thanks for the giveaway! ooohh I want to read this!! please please please! lol hopefully I win…I heard a lot of good things about this books! What an awesome interview and giveaway. It must be amazing to write a 50,000 word novel in 30 days and then have it become to popular. Wow Thanks again. My recent post 18 &amp Over Book Blogger Tag Along Friday!! Iron Fey books will be published here in Brazil next year I think, but I have no patience to wait so long! Soooo count me in! I'm most impressed by the cat training. Thanks for the giveaway! I actually just heard about these books a couple of months ago on Reading Teen's blog and have been meaning to pick them up. The covers are sooo gorgeous. Great interview! OOh! Great contest. I can't wait to read the books. Great books and open Internationally. Great interview, very unique. I have been dying to get my hands on these books for some time now. My sister and mother have read them as well as some blogger friends of mine and they can't say enough wonderful things about this series. I so would love to be entered into this giveaway. Didn't read any of them yet, but I really want to!. Heeh, thanks so much for this interview! Julie seems like such a cool person!! And yay for new books being about Vampires 'cause yes, we love them too! Cool! 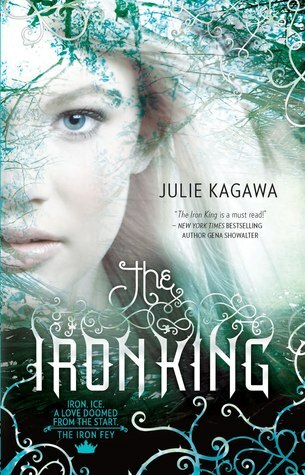 I've read so many great reviews on The Iron King and I haven't read any of these! Would love to chance to though! 🙂 Thanks! AWESOME contest! I haven't read any of these and I would love to! Thanks for the giveaway! I have been meaning to read the series but have not b en able to get around to it as yet. From the reviews I have read it seems a very good read. I LOVE the five random facts, I wish I had swam with a sea turtle… I swam with sharks… but it's not very relaxing!! I loved the first book. Can't wait to read what happens next. I WANT THIS!!! This is super awesome!! So generous! Thank you! *hope I win* *hope I win* *Hope I win*….. I can't remember if I already comment or not…so I guess I can comment twice just in case. Thanks for the international giveaway!! OMG OMG OMG OMG! I haven't read this series yet, I know! Totally crazy! But here's the perfect chance for me to win these books 🙂 Ahh! Thanks for the giveaway! Oh, that's absolutely too cool! My mind actually went blank with shock (this is sooooo generous, if that's not obvious enough). I love Julia's writing, and I'm sadly on a fence between Ash and Puck. Who could actually decide among them is beyond me. *gasp* Iron King was originally for NaNoWrimo?? That's kind of surpsrising for me. lol. I haven't read the series yet but my cousin has always been gushing about Ash. And even having not read it yet, I'm already on Team Ash. I have been meaning to grab these for the longest time and am totally thrilled at the chance to win copies! Thank you for the chance! wow. Thanks so much for the giveaway!! THis is great! i never knew this was a nano book! How cool is to have a tarantua pet?! I haven't read this series But I want to sooo badly!! Thank you for the chance to win!! I love fairies……..Please enter me in the contest!!!!!!!!! This set looks incredible 🙂 Thank you for such a great giveaway! 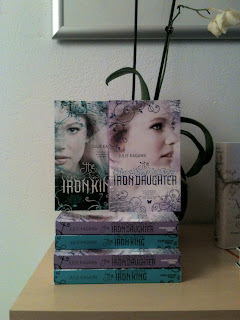 I havent' read Iron Daughter yet, so I would sure love to win this contest! Thanks for hosting it! Thanks for the giveaway! I hope I'm lucky. The interview was really fun as well, I would really love to teach a cat to sit roll or anything! Just started The Iron King online and can't wait to get the book. Either Amazon or you. I hope I win, but if I don't I'll still read it. Thank- you! I love stories about the fae and I've been meaning to pick up this series but I still haven't managed to remember to do so–while still at the bookstore (although I usually remember upon arriving at home). Great interview and what an amazing giveaway! Thanks so much for making this international. Wrestling a goat…? Really? Honestly, that looks hard to me. I would've been knocked down too if I tried. I don't know which Team I am, since I haven't read the books yet…but I love faeries!! I love the Iron Fey series. It's one of my favorites! 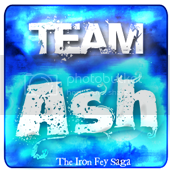 Team Ash all the way. Great Interview. Thanks for the chance! Oh yay! I'm so excited. I have been really wanting to read this series. You told me once how FAB they were and I cant wait to read them! Thank you for this great giveaway! I've been wanting to read this series, thank you for the giveaway. I enjoyed learning more about the author. lol.. Thanks for the great interview I really enjoyed it .. was fun!!! I haven't read the series yet but I've heard good things about it. I can't believe she wrote the first book in two months. That's amazing! I love making my characters suffer too, and I can't believe she wrestled a goat! LOL!!! The goat had me cracking up. Thank you for the great giveaway! I have always wanted to read these books, but haven't had the chance. I love The Iron King! I've been wanting to read this series for a long time, thanks for the chance to win them. Great interview! I'm new to the series, but I freaking love it! Thanks so much for the interview and opportunity!